​​This biennial (or sometimes perennial for 3 years) red seaweed is light yellowish-pink or light red to medium red, not shiny, and lacks veins or midribs. Its blades are commonly palm-shaped (palmate) with lobed ends, though they may occasionally be unlobed. Each blade tapers to a disc-shaped holdfast. This seaweed grows to 30 cm tall or more. Red ribbon grows on rock in the mid intertidal to upper subtidal. It can be found along semi-protected and semi-exposed shorelines from the Bering Sea and Aleutian Islands in Alaska to southern California, as well as Russia. Stiff red ribbon (Palmaria hecatensis) is less glove-shaped than red ribbon, is thicker with a leathery texture, and has more rounded tips. 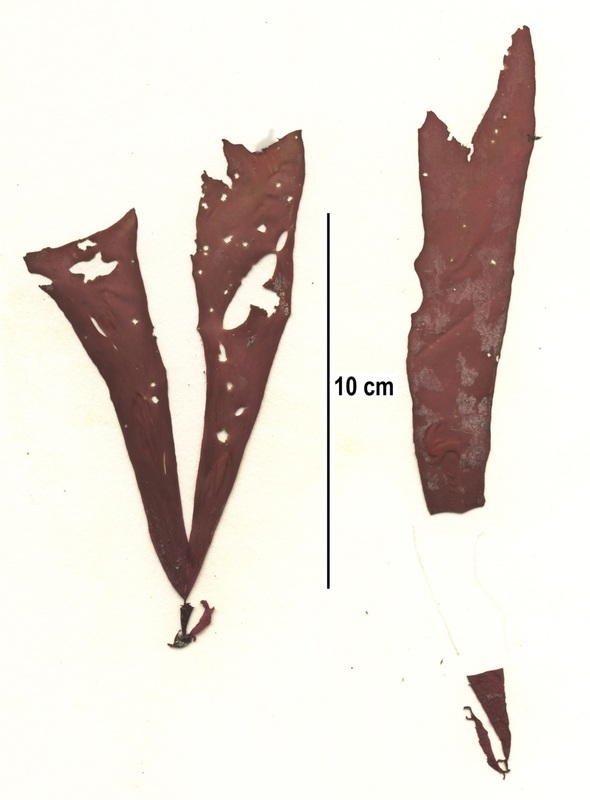 Other Palmaria species may also have similarly-shaped blades to red ribbon. Red eyelet silk (Sparlingia pertusa) is also similar, but is usually not lobed and is dotted with small holes and dark bumps (cystocarps). Red ribbon is edible and packed with good nutrients, including vitamins A and C. The blades are commonly dried, ground into a powder, and added to soups a breads for extra nutrients and texture. This seaweed is also eaten fresh in salads and other dishes. April and May are the best months in which to harvest this seaweed. Specimen collection number SCL 15320 in the UBC Herbarium Algae Database. Search the specimen collection number in the database for further information, or search the species for more information. Image courtesy of Sandra Lindstrom. Lindberg, M. and Lindstrom, S. (2010). Palmaria mollis Red Ribbon. Seaweeds of Alaska. Accessed 09/10/2015. O'Clair, R. and Lindstrom, S. Palmaria mollis (Setchell et Gardner) Van Der Meer et Bird 198. In Klinkenberg, Brian. (Ed.). E-Flora BC: Electronic Atlas of the Plants of British Columbia. Lab for Advanced Spatial Analysis, Department of Geography, University of British Columbia, Vancouver. Accessed 12/13/2013.